There is a lot that’s being said these days about doing dramatic radical things for Jesus. That has merit, but sometimes it is good to read of what it means to live faithfully in the midst of normal life. 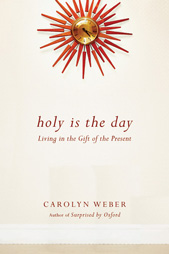 Carolyn Weber’s new book Holy is the day explores finding God in the normal things of life with incredible beauty, wisdom and intelligence. Carolyn’s first book, Surprised by Oxford, tells the story of discovering Christianity and meeting her husband while an international student studying literature at the historic Oxford University. Holy is the Day picks up later in the story as she navigates pregnancy, facing the challenges of being a Christian employed in academia and moving home to Canada. As in her first book, the stories are vividly and beautifully told. As cliché as it sounds, reading her story made me feel like I was there amidst it all. The book also shines for the depth of the theological reflection, something I think she has grown even more in since her first book. She articulates a lot of big and thoughtful ideas while still maintaining beautiful prose. I was particularly struck by her reflections on how the difficult challenges of working through the aftermath of trauma. This is definitely something that could use more and better discussion among Christians. I strongly commend this book to you. I hope it is widely read because it has much truth and beauty to communicate.